No amount of money can lessen the pain of divorce as demonstrated by revelations from Dragon’s Den star Duncan Bannatyne that his marriage break up pushed him to the brink of suicide. Despite his millions, the entrepreneur says that the end of his marriage to second wife Joanne McCue crushed him emotionally and, as the divorce process continued, he turned to drink and became increasingly depressed. 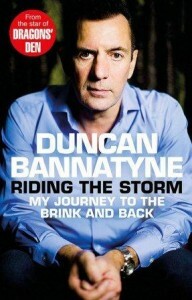 Duncan Bannatyne bares his divorce trauma in his autobiography Riding the Storm out on September 26. The business angel, well known for his no nonsense style on the popular BBC 2 business show, reveals that he had to flee the television studio to “go and cry somewhere” after discovering his wife was divorcing him. It was while filming the ninth series of Dragon’s Den that Joanne broke the news via a text message that she wanted a divorce. Duncan writes that “I couldn’t believe that after 18 years together she didn’t tell me in person”. He describes waiting for a train to London with “tears streaming down his face” and feeling that the only way he could “make the pain stop” would be to jump in front of a fast train. In a society where it still perceived that ‘real men’ don’t show their emotions, I welcome Duncan Bannatyne’s candid admissions of his fragile state of mind at the time of his marriage break down. During my decades as a family lawyer I have witnessed both men and women from all walks of life and backgrounds who have been driven to the edge of despair when they marriages fall apart. In fact I have travelled across Yorkshire to meet clients in pubs and tearooms because they have felt isolated and depressed. If you are the party seeking a divorce, consider how you will deliver what is likely to be devastating news to your partner – and how that will affect them emotionally and psychologically. You owe it the person you loved and married to have a face to face conversation. However tempting it is, do not resort to text messages or emails to break the bad news. Like Duncan Bannatyne, you may feel depressed, even suicidal, and perhaps very alone. Duncan was fortunate that he had some support from good friends including his Dragon’s Den co-star Peter Jones. However, men in particular can find it hard to talk about their feelings to their mates. A good family lawyer should be able to refer you to a counsellor or talk to your GP about what help is available. Choose your lawyer with care. Ask for recommendations from friends, colleagues and professional advisers so that you find someone you rate and like. A respected, experienced divorce lawyer will not only provide sound, practical advice but also offer you appropriate support to help you through what can be very dark days – and even months. He or she will be genuinely concerned about your emotional wellbeing. Duncan Bannatyne says that he discovered one of his “Twitter trolls”, writing anonymous “bullying” tweets, was related to his ex-wife. It is unhelpful when friends and family decide to meddle – particularly if they communicate directly with your ex. I would advise a quiet word to ask them to stay on the side-lines and offer you emotional and physical support when you need it. Duncan Bannatyne reveals that he became increasingly angry about the financial side of his divorce; worrying about how he would continue to help his children and to support charities. Such anger is understandable, however at Jones Myers we believe in taking a non-conferential approach, wherever possible, with negotiation key to resolving critical, yet often challenging, financial settlements. Both parties and their lawyers working together discussing the issues and debating different solutions, can avoid the trauma of court and reduce pressure and anxieties. What do you think about Duncan Bannatyne’s divorce revelations? Please comment below or Tweet us @HelpWithDivorce.